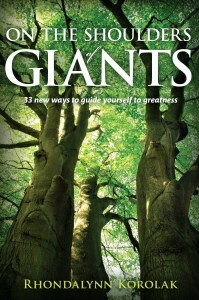 On the Shoulders of Giants is more than just another book about how to develop a positive attitude or use the law of attraction. This fresh look at 33 pieces of timeless wisdom finally puts what you want most in life within easy reach. It’s about what really works and WHY. Based on her struggle to rebuild her life after a senseless tragedy, the author brilliantly demonstrates how to make profound shifts in your life, work, finances, health, relationships, and more, whether you are going through a troubled time, or just looking for real ways to live better—much better!